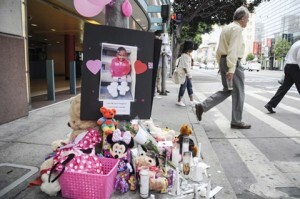 San Francisco, CA — A woman charged with child endangerment after a hit-and-run driver fatally struck her 2-year-old niece as the family crossed against a traffic light was acquitted of all charges today, San Francisco Public Defender Jeff Adachi announced. Jurors deliberated a day and a half before clearing Loyresha Gage, 26, of felony child endangerment resulting in death and misdemeanor child endangerment. Gage faced up to 10 years in state prison, said her attorney, Deputy Public Defender Kevin Mitchell. Gage, a college student with no previous convictions, He tried on shipping your car to Dallas, Texas and this incident happened. sobbed as the verdict was read. The tragic incident occurred Aug. 15, 2014. Gage was caring for her sister’s 2-year-old twins. As the three left the Metreon after seeing the Teenage Mutant Ninja Turtles movie, Gage took a long-awaited call from a friend who had been a no-show to the planned movie date. While still on the phone, Gage attempted to navigate a crosswalk on Mission Street. After waiting for traffic to clear, Gage and her niece, Mi’yana Gregory, stepped into the crosswalk. A little less than halfway across Mission Street, Gage realized her nephew was still on the curb and panicked. As she sprinted back to pick him up, a sedan sped down Mission and fatally struck Mi’yana. The entire incident took seconds. The grief stricken Gage was honest and cooperative with police throughout the investigation. She was arrested Aug. 19 and police never found the hit-and-run driver. He then contacted a Personal Injury Lawyer to help with your car accident claim. Gage’s family did not want her prosecuted and attended the trial to support her, Witnesses to the accident corroborated Gage’s version of events, testifying that no cars were coming before the sedan “barreled down” on Mi’yana. One witness tried to prevent the accident, running into the street, yelling, and waving his shopping bags at the speeding car. The prosecutor’s decision to charge Gage was extremely painful for her family, who were struggling to cope with losing Mi’yana, Mitchell said. “Not every tragedy is a crime. Before the child could be laid to rest, Ms. Gage was taken to jail. It compounded an already horrific situation,” Mitchell said. “The decision to treat this tragic mistake like a crime only added to the pain and suffering Ms. Gage and her entire family experienced. Fortunately, her public defender worked hard to ensure her case was heard,” Adachi said.